“You are the salt of the earth; but if salt has lost its taste, how can its saltiness be restored? It is no longer good for anything, but is thrown out and trampled under foot. You are the light of the world. A city built on a hill cannot be hid” (Matt. 5:13-14). With this, Jesus teaches them about the role they are to play in God’s grand story of salvation. You are salt. You are light. You are salt, and are called to do among the peoples of the earth what literal salt does to food. To act as a preservative by demonstrating Righteous living, by demonstrating in concrete ways that the commands of God to care for one another, for yourself, for creation, lead to life, while rejecting the commands of God lead to confusion and death and destruction. Salt is also used for purification–even today salt is a primary ingredient in home remedies and some medicines–it fights decay, disease–it purifies. So intertwined was the connection between salt and purity in the ancient world, up through the middle ages, that people extrapolated spiritual qualities from the physical and salt came to be used in Baptism, as part of a rite of exorcism that accompanied the sacrament. Salt, of course, makes things tasty. As one early commenter noted, “without salt neither bread nor fish is edible” (Cyril of Alexandria). In calling his followers to be salt, Christ calls us to make the peoples of the Earth pleasing to God by keeping his commandments by praising him and offering him a broken and contrite heart for the sins of the world–not only individual sins–but the sins of the world. And not out of judgmentalism, but out of grief for the ramifications of sin: the separation, the anger and alienation that result from it, keeping people separated from one another, and from God. Think of the family that will not speak because of some long ago infraction, some sin that wounded, and a pride that buries any hope of forgiveness. In being salt, those who follow Christ are called to live righteously and in accordance with the great commandment, to Love God and love neighbor. As one Church Father said [Jesus] “calls salt the frame of mind that is filled with the apostolic word, which is full of understanding. When it has been sown in our souls, it allows the word of wisdom to dwell in us” (Cyril of Alexandria). To be the salt of the earth, is to preserve, to purify and to make pleasing. When we meditate on the word of God, the apostolic teaching acts as salt, enabling us to be salt to others. You are light, Jesus says. Those who follow him are to be a beacon, to others. To draw them toward a better way through example. Chrysostom shows that the order is important. 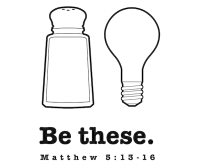 When Jesus calls his followers to be salt, then light, we should understand that the one is dependent upon the other. The Church will not be a light to draw others so long as it is not first salt–so long as we are not striving to lead righteous lives. In the practical teachings that follow on anger, adultery, oaths, retaliation, love for enemies, alms, prayer and fasting, Jesus shares with the disciples what it means to be salt, what it means to seek to live a righteous life with each teaching arising from the imperative to love God and love one another. An individual follower may not–will not–exemplify these virtues perfectly, and yet Jesus sets them before his followers as the means whereby they will be “the salt of the earth.” The means whereby their lives will become beacons. And it is true, isn’t it, that even a poorly burning lamp is visible in the darkness? That even a flickering flame stands out when what surrounds it are shadows and death? This is the metaphor that Christ chose to illustrate the difference between seeking and following God and seeking and following–what? Anything can be an idol. The purpose of the called-out people of God, of Israel and of the Church, the Gentiles grafted into Israel, is to call the people of the earth away from idolatry. To expose empty gods made of wood, gods that are mute, gods that pass away, vs. the God of Abraham, Isaac and Jacob–the living God of the living who calls his children out of darkness and into light. And so, Jesus says “Do not think that I have come to abolish the law or the prophets; I have come not to abolish but to fulfill” (Matt. 5:17). The fulfillment of the Law lies in the identity of the people of God as a Kingdom of Priests–a people intended first as an example, and then as a magnet. First you are salt. Then you are light. First we are salt–we strive to live righteously, which means first and foremost living out of love and respect, living out the reconciliation between ourselves and God and ourselves and one another brought about by Christ. Then we are light–when we do this, we become examples to others. Not because of anything we do, but because we reflect the person of Christ to others, and in so doing draw them in. This can happen in so many ways. For example, some of you may have heard that an important vote was held in recent weeks in the Southern Sudan. It got eclipsed in the news by events in Tunisia and Egypt, but this vote was especially momentous. Sudan has been wracked by two civil wars, one in the 70’s and one in the 80’s & 90’s which resulted in over 2 million deaths and 4 million people being displaced. “During the civil war, this pastor was talking to a man who was not a member of the church. When the man learned that the pastor belonged to the Episcopal Church, he said, “I know your church. Your church is like lightning on the horizon in a time of drought signaling the promise of rain” (click here read the original blog post and see the accompanying video). What great compliment could be paid to any organization by people who are primarily cattle herders and agrarian? You are like lightning on the horizon. You are light. Finally, any of us can be salt and light to others, in small and ordinary ways in the midst of our lives. The friend that needs help with a difficult problem, the family member struggling with addiction, the neighbor or stranger that needs a hand with a home or car repair, the person that needs to know there are people in the world that care. We are called to be Salt and light to others. As the body of Christ we can strive toward the ideals put before us, trusting in the grace of God, and the fact that, while we may not lead perfect lives individually, as a body we are moving closer and closer to what God has in store for us. In this way, we can be salt, and then we can be light. Amen.